* southeastern Rufous-vented Ground-Cuckoo (Neomorphus geoffroyi dulcis). These species are found in the Atlantic Forest and Cerrado biome in Brazil. 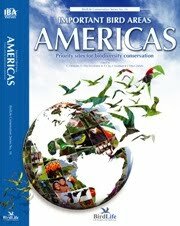 All seven species face immediate and significant threats primarily from the threatened destruction and modification of their habitats from conversion of agricultural fields (e.g., soybeans, sugarcane, and corn), plantations (e.g., eucalyptus, pine, coffee, cocoa, rubber, and bananas), livestock pastures, centers of human habitation, and industrial developments (e.g., charcoal production, steel plants, and hydropower reservoirs). Granting protection under the ESA for these seven species prohibits the import or export of the species, or their parts or products, as well as their sale in interstate or foreign commerce. The only exceptions are for scientific purposes and to assist in efforts aimed at enhancing the propagation or survival of these species. The final rule will publish in the Federal Register on Dec. 28, 2010. From Environmental News Network comes a press release about the discovery of a Harpy Eagle nest with chicks located in Belize, 700 miles north of the raptor's known range. 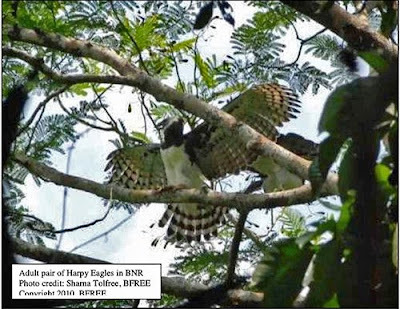 TOLEDO DISTRICT, Belize – Scientists recently discovered an active Harpy Eagle nest in the Maya Mountains of Belize. Thought to be locally extinct in Belize since 2000 and extirpated from Mexico and most of Central America north of Panama, Harpy Eagles (Harpia harpyja) are designated as “Near Threatened” by the International Union for Conservation of Nature and are considered “Critically Endangered” in Belize. 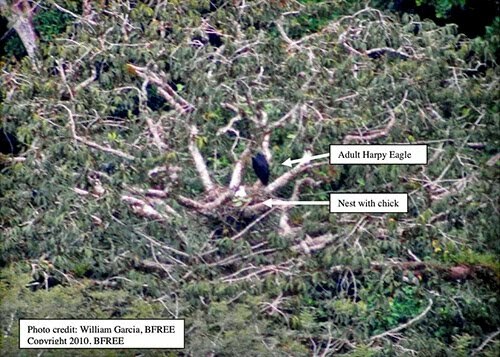 This discovery by a team from the Belize Foundation for Research and Environmental Education is significant because the active nest represents the most-northerly known Harpy Eagle nest in the Americas. According to H. Lee Jones, author of The Birds of Belize, it is the first active Harpy Eagle nest recorded in Belize. Over 1100 km (~700 miles) separate these eagles from other populations. Harpy Eagles are known as the most powerful eagle in the Americas, hunting prey as large as monkeys and sloths for food. With 7-foot wingspans and individual birds weighing up to 20 pounds, they are a formidable predator. Due to deforestation and hunting, Harpy Eagles are typically missing from most of Central America’s rainforests where they once freely ranged. Secretary of the Interior Ken Salazar announced today the award of more than $19 million to support 24 conservation projects benefiting fish and wildlife on more than 5,900 acres of coastal habitats in twelve states in the U.S. through the 2011 National Coastal Wetlands Conservation Grant Program. These federal grants will be matched by nearly $18.7 million in partner contributions from state and local governments, private landowners and conservation groups. 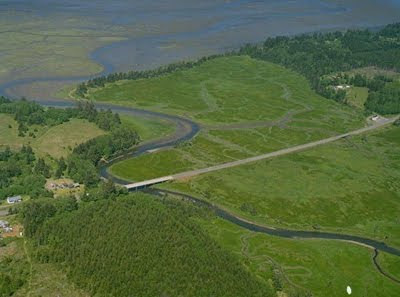 The National Coastal Wetlands Conservation Grant Program is administered by the U.S. Fish and Wildlife Service and funded under provisions of the 1990 Coastal Wetlands Planning, Protection and Restoration Act. Funding is provided by Sport Fish Restoration Act revenue – money generated from an excise tax on fishing equipment, motorboat and small engine fuels. Once again, another group of enthusiasts -- anglers -- have generated funds that will benefit birds and birders. Thank you. Coastal areas comprise less than 10 percent of the nation’s land area yet support the majority of wildlife species, including 75 percent of migratory birds, nearly 80 percent of fish and shellfish and about half of all threatened and endangered species. Did you know that 75 percent of migratory birds rely on coastal habitat? To see if the funds will benefit habitat near you, check this list. It provides good details about each grant. Have you perused or subscribed to The Cornell Lab of Ornithology's YouTube channel? It offers an incredible selection of videos related to birds and birding. For instance, check out this video that illustrates the feeding technique used by White-winged Crossbills to extract seeds from white spruce trees. The crossbill item is one of a handful in the Lab's "How Nature Works" videos. 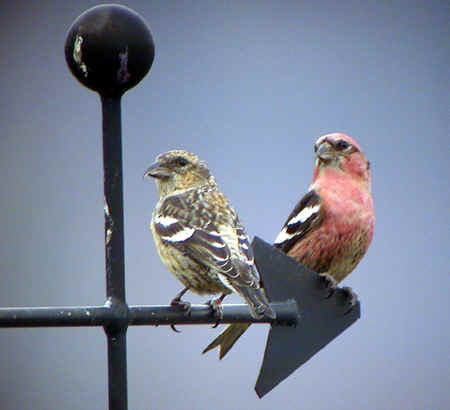 You can learn more about White-winged Crossbills, including their song and call, by visiting Cornell's All About Birds website. It's quite a treasure trove. "Please do not fear the birders"
A letter written by Richard A. Danca in Newton, Mass., likely needs to appear in many newspapers and on websites far and wide before the annual Christmas Bird Count begins on Dec. 14. The letter might dispel some unease and prevent incidents such as the arrest of birder Paul Peterson of Boston last January. Please don't panic if you see people with binoculars tramping around the week before Christmas, even if it feels like they're peering into your windows. It's only birders (birdwatchers, if you must) participating in the annual Christmas Bird Count, looking for every bird they can find, even the ones in your back yard. He also provided the URL for National Audubon Society's CBC information and ended his letter with an invitation of sorts: "Even if you don't feel like counting birds, you could help by ensuring that your bird feeders are full." The U.S. 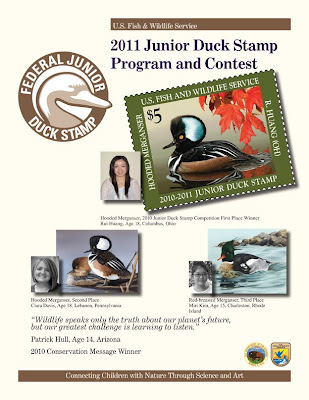 Fish & Wildlife Service enacourages K-12 students to share their art skills while learning about ducks by entering the 2011 Junior Duck Stamp competition. Most states' competitions have a March 15, 2011, deadline, but some states have much earlier deadlines, such as January. Check your state on this map to confirm its rules and deadline. In addition to awarding national recognition and cash prizes ranging from $2,000 to $5,000 for artwork, the competition includes a conservation component. 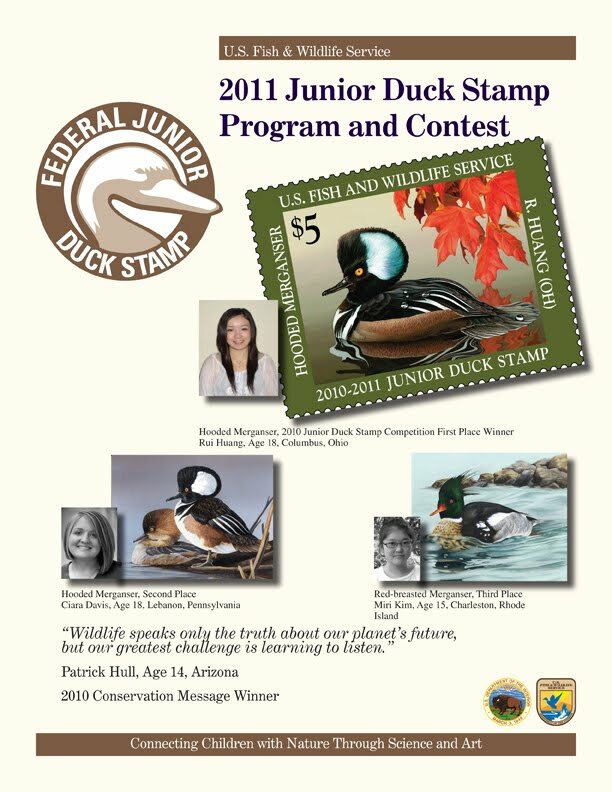 Students can submit a conservation message that "expresses the spirit of what they have learned through classroom discussions, research, and planning for their Junior Duck Stamp Contest entries." The first-place winner will receive a $500 cash prize. The program also recognizes "the integral part teachers and parents play in education and the future of the youth of our Nation," so it provides the national winner, a parent or guardian, and the winner’s teacher with a free trip to Washington, D.C., for the First Day of Sale ceremony in late June/early July. 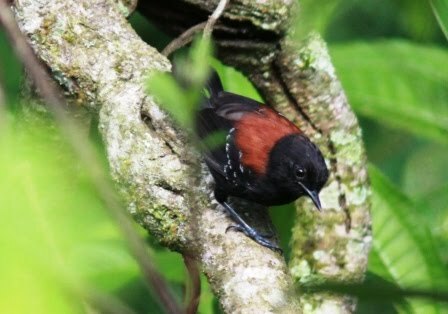 The Kauai Island Utility Cooperative entered a plea agreement today in federal court in Honolulu to resolve violations of the Endangered Species Act and Migratory Bird Treaty Act, the U.S. Department of Justice announced today. KIUC pleaded guilty to count one and count 16 of a 19-count indictment returned by a federal grand jury in May 2010. Count one charged a violation of the ESA by knowingly “taking” at least 14 Newell’s shearwaters, a federally protected threatened species, at or near Keālia Beach. [Newell's Shearwater (Puffinus auricularis newelli) is a subspecies of Townsend's Shearwater. --WB] Count 16 charged a violation of the MBTA by the “taking” of at least 18 Newell’s shearwaters, also protected as a migratory species, at KIUC’s Port Allen facility. Under the ESA, “take” means to harass, harm, pursue, hunt, shoot, wound, kill, trap, capture or collect, or to attempt to engage in any such conduct. KIUC admitted in its plea agreement that since June 2005, at least 14 Newell’s shearwaters were found dead near KIUC power lines near Keālia Beach and Donkey Beach. At least ten more shearwaters were found since 2005 near other KIUC power lines, including lines in and near the Wailua River Valley, Waimea River Valley, Eleele, and Kapaa. Necropsies of some birds concluded that they died from blunt force trauma consistent with a collision with a power line or other solid object. Eyewitnesses have observed such collisions with KIUC power lines. The utility cooperative's press release about its responsibilities appears here. A recent collaboration between industry and environmental groups resulted in Georgia-Pacific announcing that it would not buy wood fiber from areas recognized as environmentally sensitive or where slow-growing hardwood forests have been cleared in order to plant quick-growing pine. In a press release, American Bird Conservancy lauded Georgia-Pacific's new policy, which affects 11 sites, and pointed out that five sites are globally Important Bird Areas. When a site receives the IBA title, it's recognized as significantly important habitat for one or more bird species. * Croatan National Forest (40,000 acres) in North Carolina, known for carnivorous plants as well as Peregrine Falcons, Bachman’s Sparrows, Red-cockaded Woodpeckers (62 clusters) and Swallow-tailed Kites. To learn more about IBAs, click here for an incredible 15-page PDF that includes maps, graphs, pictures and details. The shiny feathers on Common Ravens, for instance, display a unique structure that might prove useful to humans, according to research by scientists at The University of Akron. Integrated bioscience Ph.D. student Rafael Maia, postdoctoral researcher Liliana D’Alba and assistant professor Matthew Shawkey found that shiny black feathers have a single thin keratin layer but loosely organized melanosomes. This differs from iridescent feathers' single, thin layer of keratin atop a linearly organized layer of melanosomes (the cell subunits containing the light-absorbing pigment melanin) as well as matte-black feathers' thick keratin layer and disorganized melanosomes. The research, supported by the U.S. Air Force Office of Scientific Research, might represent an evolutionarily intermediate step between matte and iridescent colors and also provides possibilities for new ways to produce glossy surfaces, according to the university. The scientists' findings, "What makes a feather shine? 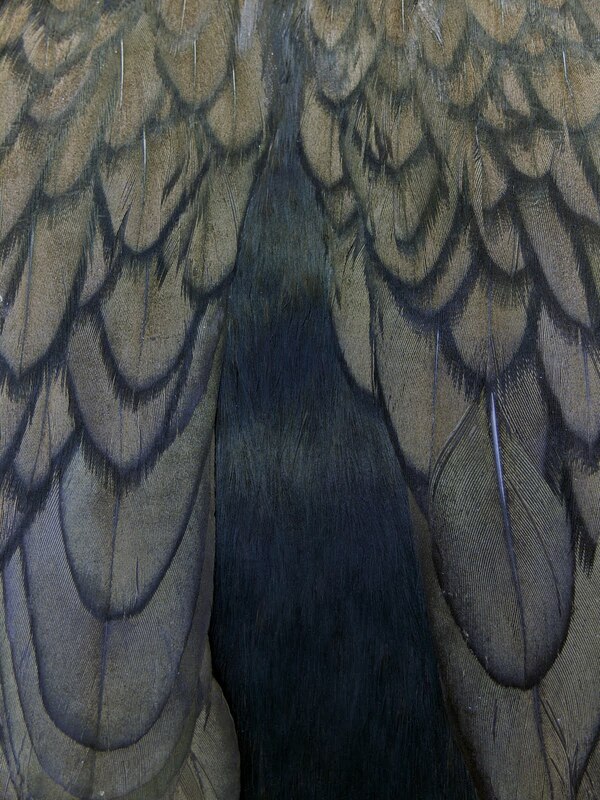 A nanostructural basis for glossy black colours in feathers," appeared on Proceedings of The Royal Society B today.